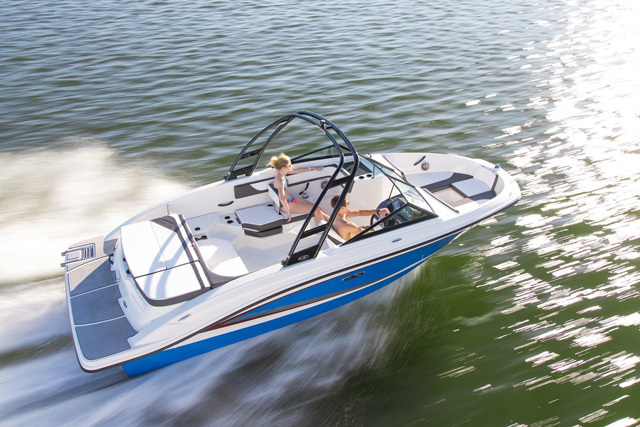 The Sea Ray 290 Sundeck is one bodacious deck boat. 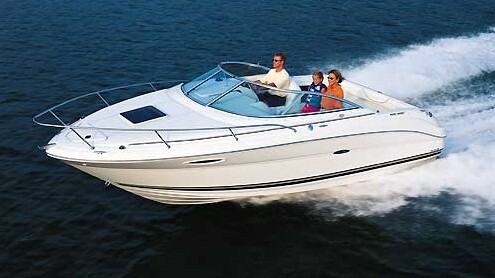 When you think of Sea Ray deckboats, you most likely picture models like the 220 Sundeck or the 240 Sundeck. That’s only natural, because these sizes are quite popular. You’re likely to see one of these models tooling around on lakes and bays anywhere in the nation, and you’ll certainly see them more often than larger Sundecks. At least, that’s been true up until now. 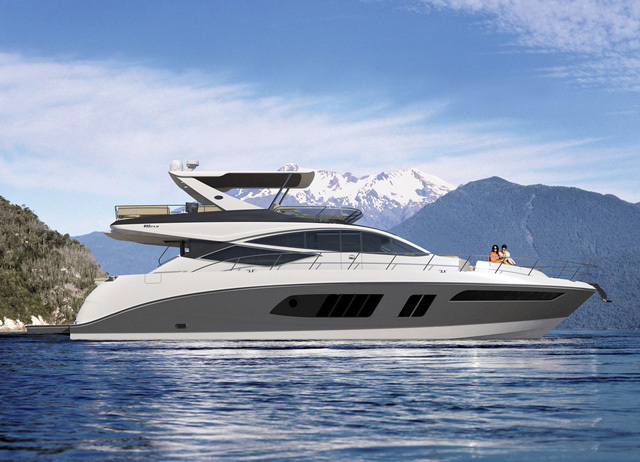 As of this year, there’s a newer, bigger, and arguably better Sea Ray Sundeck: the 290. Is it going to eclipse its smaller siblings? Well, probably not, but only because bigger boats cost more and sell in lower volume. Setting that factor aside, however, the 290 Sundeck is going to cast a very, very long shadow. If you're looking for a good time out on the water, the Sea Ray 290 Sundeck aims to please. What’s so different about the new 290? The first thing that struck me when I took one for a sea trial was the boat’s sleek looks. Unlike its similarly-sized predecessors, the 280 and 300 Sundecks, the 290 has its anchor, an optional windlass, and a boarding ladder all integrated into the bow, hidden beneath a hatch. It’s quite a slick, functional arrangement. 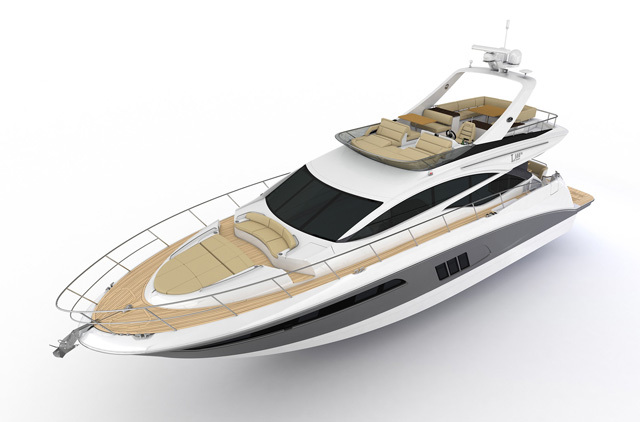 The stern look sleeker than previous models, too—and more relaxing. It sports a pair of aft-facing reclining loungers which are oooh-yeah comfy to kick back in. Older models have more of a bench seat type of arrangement back here, and the lounges are a significant improvement. The aft end of this boat is where some serious improvements can be found. The lounges are a stand-out. Another comfort-boost can be found in the head compartment, tucked into the passenger’s side console. Actually, it’s not fair to say “tucked in,” which may give you the impression that this is a cramped, confined space. It isn’t. This is actually a huge head, with a sink, countertop, vanity, opening port, and stowage. Sea Ray gets bonus cred for finishing out-of-sight areas like under the sink, where the stowage compartment is carpeted. Even the swim platform shows some new thinking, with a swing-down submersible swim-step. Glance at the beefy stainless-steel hinges, to get an idea of the quality hardware Sea Ray puts on this boat. There’s also foamy SeaDek padding on the platform, which feels great on your bare feet and isn’t the least bit slippery when wet. And there's a small drink bin back here for easy access to frosty beverages, though it could be improved by adding insulation. You want gobs and gobs of seating? That's no problem on the 290. Other entertainment highlights include a wet-bar with a sink, countertop, and optional refrigerator and/or electric grill. There’s room for a huge crew, with comfy seating for up to 17—yes, 17—people. 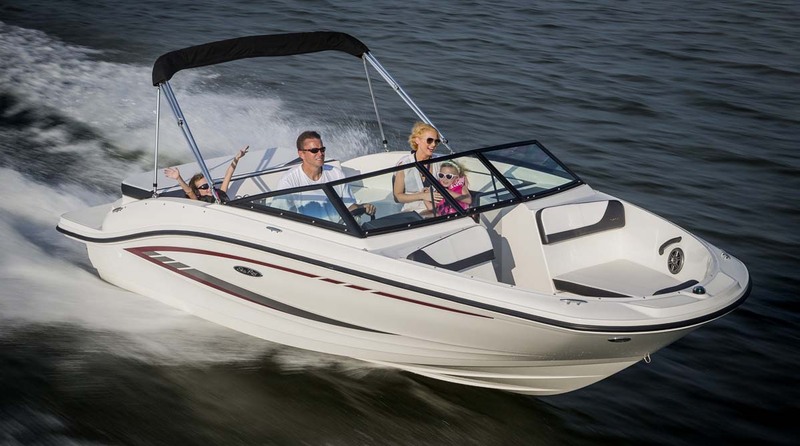 And when entertainment includes watersports or thrill-rides, the 290 won’t disappoint. Our test boat had the standard-issue MerCruiser 350 MAG with a Bravo III stern drive, and we zinged across the bay at over 40 MPH. You want even more speed? There’s an optional 8.2 MAG, which gets you another 80 horses. In all honesty, though, you really don’t need it unless top-end speed is a big priority. 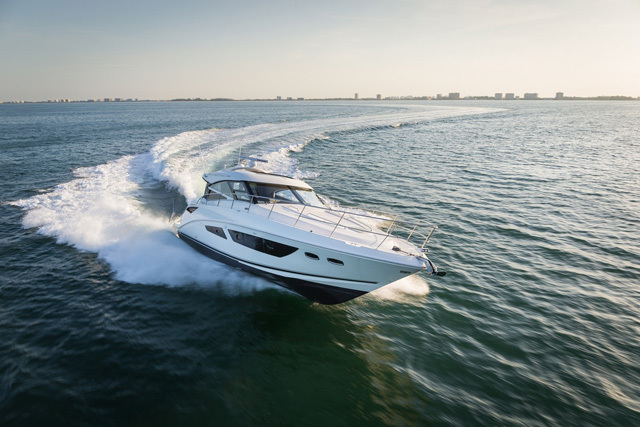 The 350 MAG gave us a cruise of around 32 MPH, and with the 290 Sundeck’s 21-degree deep-V hull, the ride through a one-foot chop was both smooth and stable. There’s one other thing you need to know about the new 290 Sundeck: is comes with a new and improved warranty, too. One of the reasons you buy a boat new is to avoid all the maintenance headaches and expenses that go hand in hand with used boats, and Sea Ray is putting their money where their mouth is, on this count. 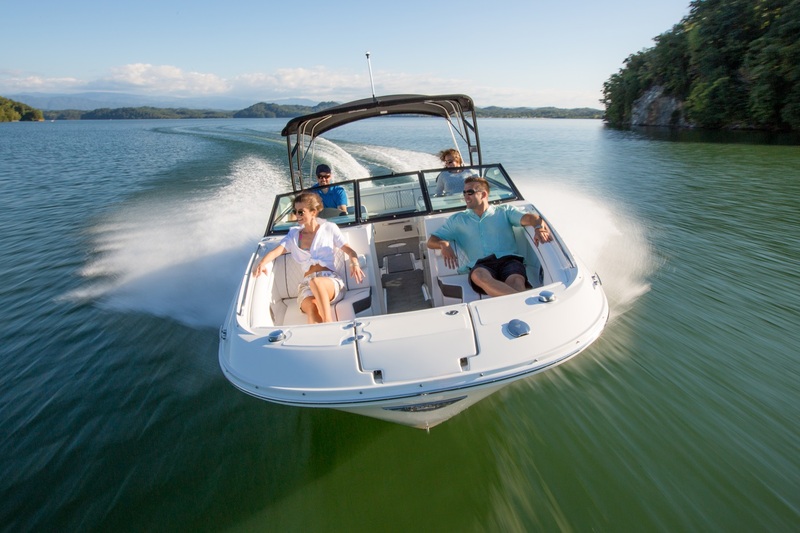 The “SURPA5S” five-year warranty they’re offering on 2015 sport boats is bow-to-stern coverage for both defects and workmanship. That includes the powerplant, and goes along with a limited lifetime structural hull warranty. And that makes a lot of sense—because if you end up buying a 290 Sundeck, there’s every reason to believe you’ll want to hang onto it for the rest of your boating life. See Sea Ray 290 Sundeck listings.